I seem to have been doing a lot of working to deadlines recently and a couple of weeks ago, I had a moment where I realised that all I was doing was just producing, producing, producing. I was feeling up against it and had lost my flow. I took the next day off to do something purely for fun and made a conscious decision to let go of the push to have x number of pieces done by x date. Since that day I have felt so much better and have noticed new energy coming into the work and miraculously I hit my major deadline - in a much easier, happier way. A good lesson for me. I’m now thinking more about what I’d like to work on rather than what I should be working on. I'm very pleased to see that I've just been featured in Saatchi Art's latest newsletter. A great start to the weekend! I'm very pleased to have been selected to take part in the Art for Youth exhibition at the Mall Galleries in St James's, London. The exhibition will take place 13th-15th December, with 35% of sales going to the charity U.K. Youth. I'm excited and very honoured to be a part of it! Today I spent most the day wrapping paintings, which are being picked up and taken off to the Affordable Art fair tomorrow morning. I found a moment amongst the foam and bubble wrap to take a snap of this one. Another of the pieces thats off to the Affordable Art Fair in Hampstead next week. If you're coming along, look out for The ArtDog Gallery stand and say hello to Pippa. A new piece finished last week and back from the framers today. I'm currently gearing up for the Hampstead Affordable Art fair starting on 16th June - and I have quite a bit if work still to do - eekk! This pic was taken at our Open Studio's last weekend - I love it with open door and the metal staircase in the background behind the painting. Wow, I'm feeling very lucky today in that I have been featured on two blogs - cheekybillo.com and hellolovelyliving.com - both beautiful places to go and have a look around. I designed some PC and phone wallpapers which you can download - along with a whole load of others to choose from created by various different artists and designers. Thank you Ena and Stina so much for these awesome features. I've just been to see a couple of my pieces up on the wall in this very beautiful kitchen space - thanks so much Miles and Andrea for letting me take these pics - they are looking fab! 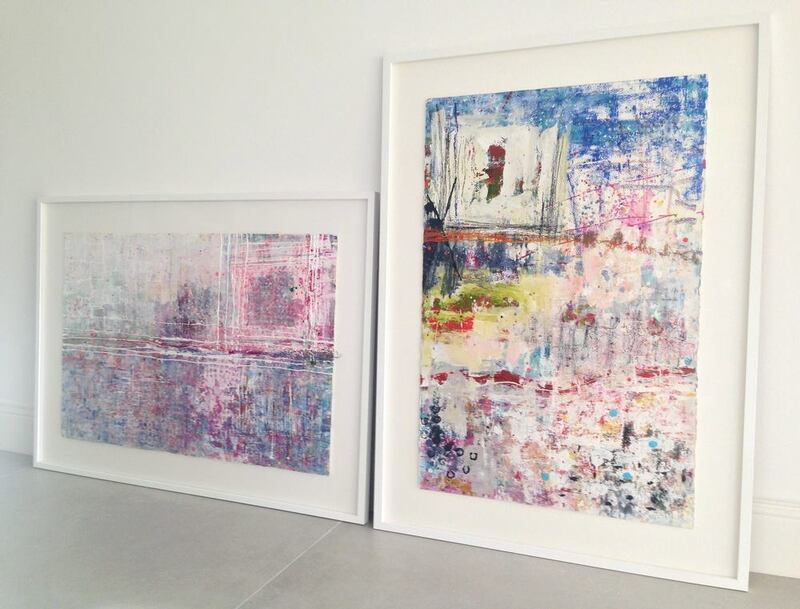 I've just had a new batch of paintings delivered by my framer - always exciting! Here are two of them. The smaller one 'Stella' was sold about a year ago but has just had non reflective glass put in which looks fab.